Group Lovelyz (Baby Soul, Yoo Jiae, Seo Jisoo, Lee Mijoo, Kei, JIN, Ryu Sujeong, Jeong Yein) looked back on their activities until then to welcome the 3rd week since the release of their 2nd album 'R U Ready?' and revealed their plan in the future. There's a reason why Lovelyz mentioned response to camera and breathing on stage. 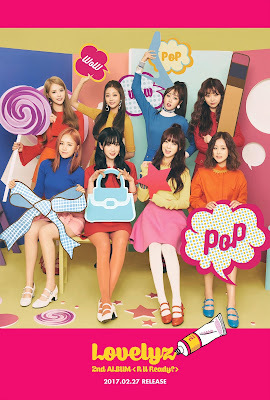 Lovelyz's songs are known for their detailed parts given to each member, and the title track for 'R U Ready? ', 'WOW!' is the song with the most elaborate parts distribution among them. However, right away, Yoo Jiae confessed, “Me, while singing my part, I was into the stage so much that I once sang another kid's part. It was during today's rehearsal,” evoking laughter. Another regret from the 'WOW!' 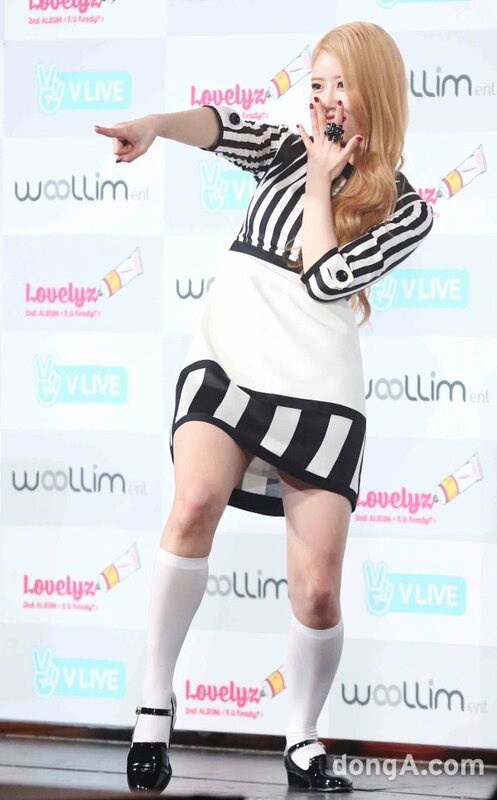 promotion is Jeong Yein's injury. Jeong Yein who suffered from an ankle injury during the practice before the comeback is unable to participate in the music show stages still as she is focusing on her treatment. Lovelyz, who mainly performed at music shows after their comeback, are planning to meet fans through all sorts of entertainment programs. Kei said, “Now we're pouring into the broadcasts (that we appear in). I'm going to appear on ‘Duet Gayo Festival’,” and Baby Soul hinted “We come out on ‘Singderella’, ‘Yang Nam Show’ too, and we're going to start with ‘Weekly Idol’”. Baby Soul said, “I'm not going to do well if I actually do it. I'm going to be by the side of the person who's really good at cooking, picking ingredients, fishing, I'll do well in such things,” already having an idea of her own position. She said, “I also want to go on ‘Jungle’”, and Kei said, “(Baby Soul) really wanted to go on 'Jungle'. She's pretty with no makeup on so it's possible for a reveal of her bare face,” also recommending Baby Soul for 'Jungle'. Right now, they were planning on meeting fans through various entertainment programs, but they had a goal of meeting more fans through their second concert. Finally, Lovelyz thanked the fans and company staff who has been supporting them and promised to do their best until the end. Lovelyz said, “We're always thankful to the fans. The cheers for us is really great. We gain strength every time we hear those cheers. We're also Jungyeop's (Woollim Entertainment's president Lee Jungyeop) kids. He really does a good job. During company dinners, he would call us ‘Lovelyz friends~’ like this,” giving their gratitude to fans and the people around them. Baby Soul said, “It's been 3 weeks since our comeback and Yeinnie is recovering, so I hope that we will complete this promotion with her. We'll do our best in showing you a good image until the end. We hope that we can meet everyone more this year,” and requested for unchanging interest and love. Group Lovelyz (Baby Soul, Yoo Jiae, Seo Jisoo, Lee Mijoo, Kei, JIN, Ryu Sujeong, Jeong Yein) revealed the behind the scenes story of their new song ‘WOW!’. Before their appearance on Mnet 'MCountdown' on the 16th, Lovelyz met with Sports Donga and shared several stories behind the song ‘WOW!’. The topic today, as expected, was the killing part ‘She's pretty, she's pretty’. In the lyrics for ‘WOW!’, Yoo Jiae and Kei received attention for their unique performance together, singing ‘She's pretty, she's pretty’. Particularly, Yoo Jiae's ‘She's pretty’ sounds like ‘Jiae pretty’, there was curiosity of whether the lyrics were intentional. Yoo Jiae said, “The lyrics weren't originally ‘Jyae ippeo (she's pretty), yae ippeo (she's pretty)’, but ‘Jyae ippeo (she's pretty), kyae ippeo (she's pretty)’,” revealing the behind story of ‘WOW!’. Kei said, “When ‘Kyae ippeo’ was sung, it sounded like a bad pronunciation (Kae ippeo (T/N: 'Freaking pretty')) so we changed it to ‘Yae ippeo’,” revealing the reason that only made her laugh. On the question of whether the other members liked them, Mijoo said, “I like it,” but added, “I like it, but...” telling that she had something to say about it. “I hope they would think about the people in the middle. We're dancing in the middle, but when you look this way, she's here pretending to be cute and when you look that way, she's there pretending to be pretty, so we're looking elsewhere on purpose,” Mijoo joked, expressing her little discontent, evoking laughter. 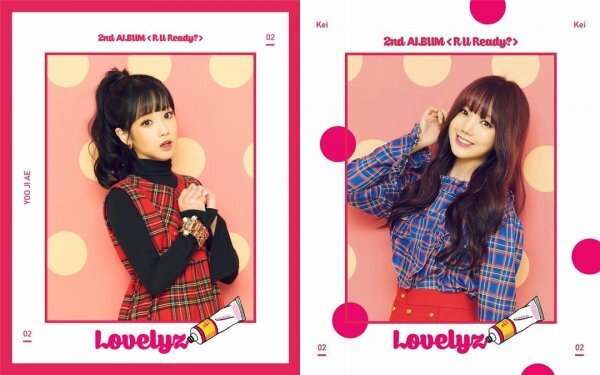 Meanwhile, Lovelyz released their second album on the 26th of last month and are now promoting their title song ‘WOW!’.